Timing being everything, Isabel's new CD, Preludios, was released the day we spoke. "I'm just super proud of it," said Isabel. "It's very fun music." "It's all Spanish music. I picked all of it. Along with other songs, a lot of it is repertoire that started with my very first Spanish song cycle, de Falla's 'Canciones populares españolas'. The CD is for everyone." The order of the songs would make a perfect live concert, especially with the mood enhancing effects provided by Isabel's accompanist Brian Zeger. A number of high points include Track 1, Sólo las flores sobre ti (Only the flowers over you), a compelling introduction to the sheer beauty of Isabel's voice. Her phrasing is exquisite, the melody is haunting. It is a song of mourning and an intimate message of love. Track 4, Oracion De Las Madres Que Tienen A Sus Hijos En Brazos (Prayer of mothers holding their sons in their arms) is a profound and familiar plea, "Sweet Jesus, I beg you... That my son not be made a soldier." If digital recordings were like vinyl, then I'll be wearing out Track 9, Jota - by Manuel de Falla. The flirtation is irresistible, the lover's desire is clear. "Although your mother may not like it." Track 14, is the well-known Clavelitos (Little Carnations) by Joaquín Valverde. It is the best rendition ever recorded. More importantly, Isabel Leonard stirs up curiosity and longing for the composer's other works. "The very last track on the album [Arrorro Mi Nene] is the lullaby I sing to my son every night. It's a great album to get people enticed into listening to lullabies. I plan on doing a lullaby CD at some point - to get people interested in all kinds of music. My mother is from Argentina. So, I have a heavy Spanish influence in my background. This is repertoire I feel very close to. It's something about the harmonics and the way the music is constructed. It taps into my heartstrings." Isabel Leonard made her debut at San Francisco Opera in November 2013 as Rosina in the opening night cast of Il Barbiere di Siviglia. Conducted by Giuseppe Finzi and with stage direction by Emilio Sagi, Isabel's subtle humor and confident manner created a portrait of Rosina that pushed Rossini and bel canto comic opera straight into the 21st Century. The often seen conniving giddiness and over-the-top frills were replaced by a down-to-earth approach that was fresh and immediately within reach. The same can be observed in the recent PBS broadcast of La Cenerentola from the Met. 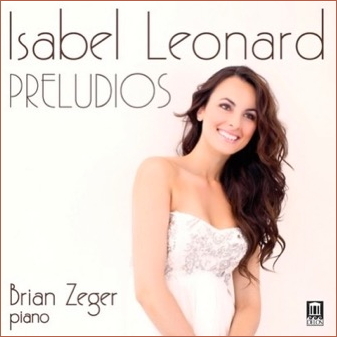 Isabel's radiant beauty, fluid technique, dramatic sensibilities and straight-forward assuredness make her the ideal heroine of contemporary composition and a goddess for classical re-construction. I asked Isabel if classical music was a part of her growing-up experience. Was grand opera always in view? Where it's all headed following L'Heure espagnole, is to the Met's Summer Recital Series where Isabel will appear at Central Park SummerStage and Brooklyn Bridge Park, Pier 1 with baritone Nathan Gunn, soprano Janai Brugger, and pianist Dan Saunders. Then on to Santa Fe Opera, August 1 for the world premiere of Cold Mountain by composer Jennifer Higdon and librettist Gene Scheer. Based on the Civil War novel by Charles Frazier, Isabel will create the role of Ada Monroe and will be paired with baritone Nathan Gunn as W.P. Inman. In between the five performances she will fly up to the Aspen Music Festival, to sing the Berlioz Les nuits d'été on August 9 - another dream come true for lovers of classical art song. "When I was in high school, I sang with a jazz band, I did musical theatre, all those things. For me, to move into classical music seemed just a progression of styles. It wasn't so different in how I was singing, it was just new music. Even now, I would love to sing with a jazz band again or do musical theatre. To me, it's about healthy and good singing that should translate into a lot of different styles." "It was mainly that I wanted to be in the theatre. I wanted to be onstage. At the time when I was first applying to schools, I didn't know exactly what that meant. But, once in Juilliard and you do your undergrad and your master's intensive and then get entrenched in classical music - that's how it continued for me. I find that a lot of young people don't even know what's happening. I think the key is that the opera companies have to really stretch themselves when it comes to their PR. They have to figure out where they are going to make their biggest impact in promoting operas and the different venues. They can't just go to the tried and true venue that they've always gone to. They have to go to even more."